If purchasing Custom Tray color or handles, after selecting from the options, please note here your requests as previously discussed with us on Etsy convo so we can refer back to our convo for details. 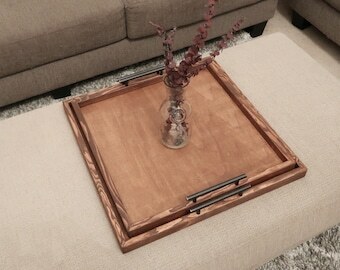 The Horizon handcrafted wooden rustic trays. 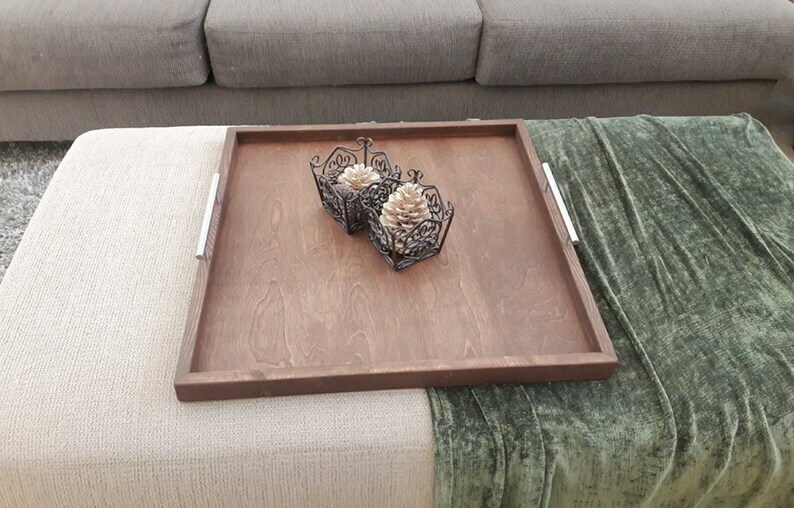 This beautiful, large, yet pleasingly light weight, serving tray is perfect for coffee tables, ottomans, as well as any other serving or home decor use. These trays are available in different colors options. The tray on the main listing photo is "Brown Stain". Each tray is made to order and finished with a matte sealer for added protection. I have over 18 years experience in wood construction and enjoy this aspect of creating with wood for home decor. *Actual colors may differ from screen to screen as not all cameras, monitors, screens are calibrated the same. *Colors are approximate and not exact matches. *Please note that these trays have a rustic finish, not a smooth finished furniture style finish. *Custom Order Sales are Final. No returns, refunds, or exchanges permitted. We are not responsible for items damaged during shipping. You may contact the courier to resolve shipping damage issues.